Christmas is past once again and the New Year is upon us! I’m looking forward to 2015 – 15 is my favorite number so somehow I feel like this just might be a great year for me 🙂 I wanted to find time to set up a fun tablescape for New Years but it didn’t happen. Sew a Fine Seam is back at work – I’ve been picking up new wholesale clients for my pillow business and I have over 80 pillows to get made by the end of January. And counting – I’ll take more if I get them! Before we move on to the New Year I’m sharing one more Christmas decor post. 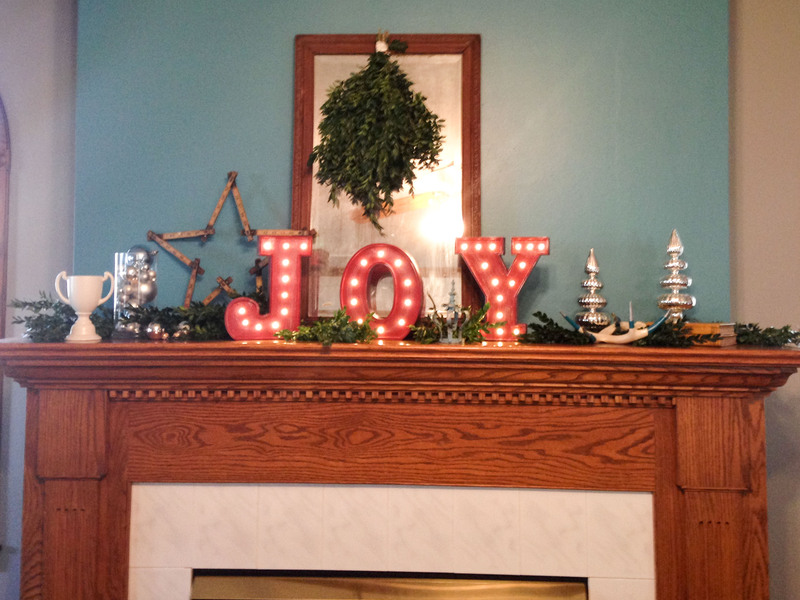 I decorated a friend’s home this year and I didn’t share the pics yet. I love decorating for friends! 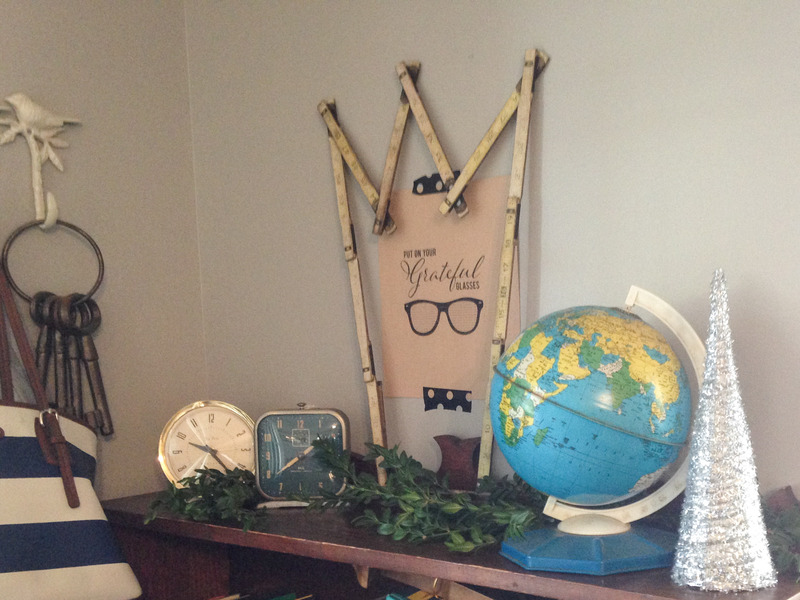 It’s fun to go into a different home than my own and take someone else’s stuff and see what I can put together to make it beautiful and cozy. I forgot to take my real camera with me so you will have to put up with my iPhone pics but I think you’ll find the beauty in my friend’s home and perhaps some inspiration for next year’s decor. 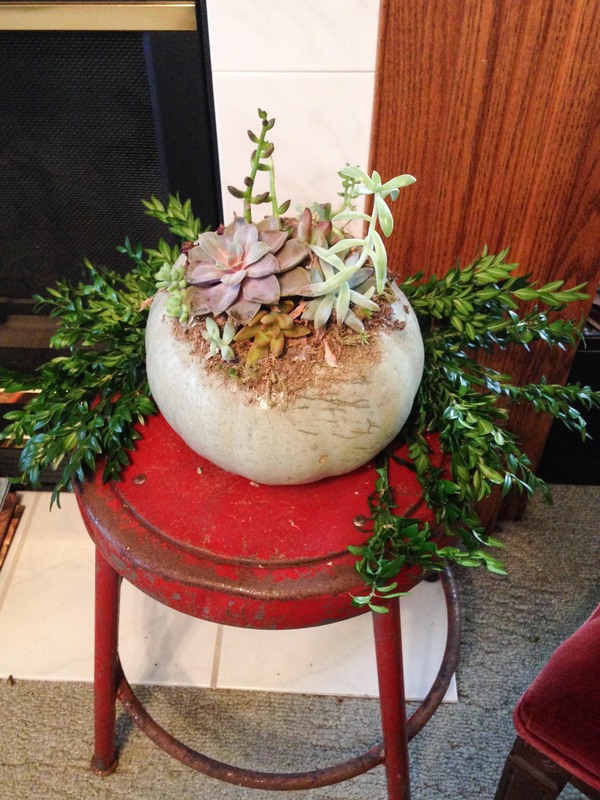 Her cool succulent arrangement from fall still looked great and with a bit of boxwood added and the red stool I thought it slid right into Christmas wonderfully! 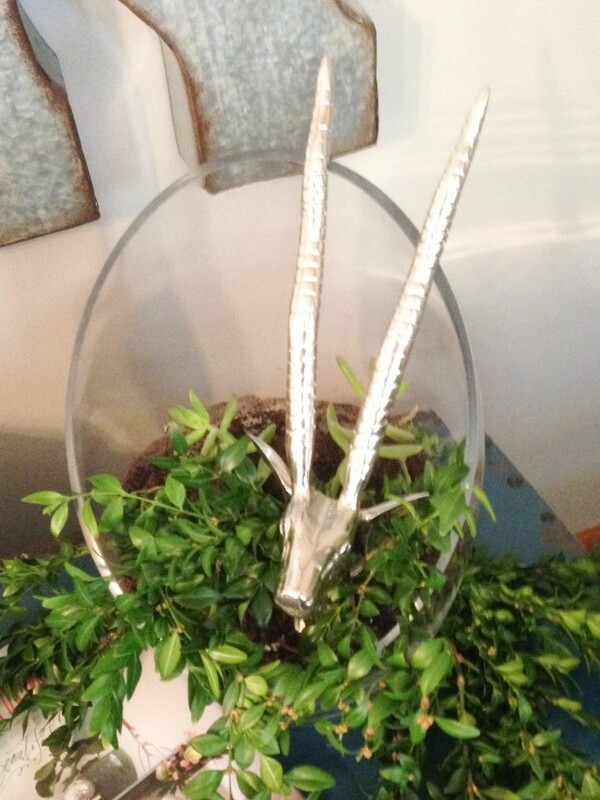 This silver trophy head ended up being my favorite – it’s tucked into a tiny pot that had held a plant and the antlers rest on the back of the big pot. I just loved how this turned out. This light. So awesome. 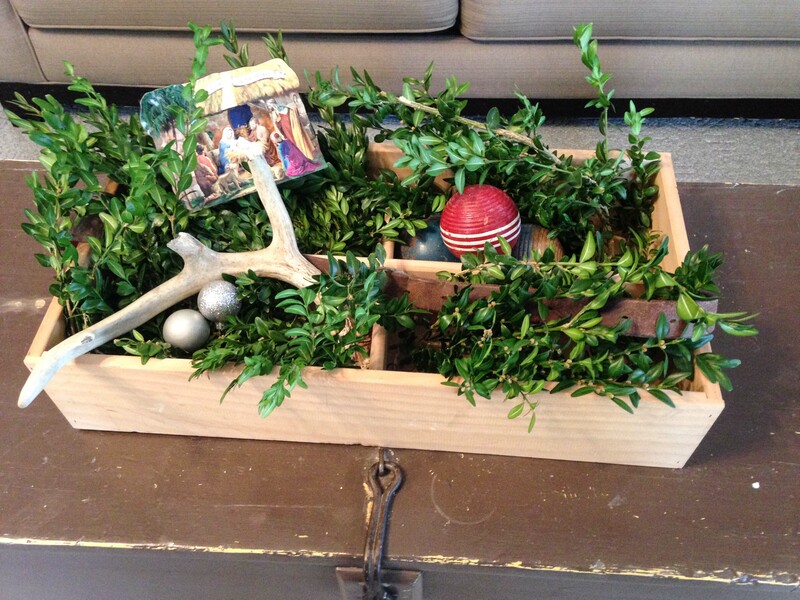 I wanted to haul off with it too – every time I’m in my friend’s house I wish I could ‘steal’ it! 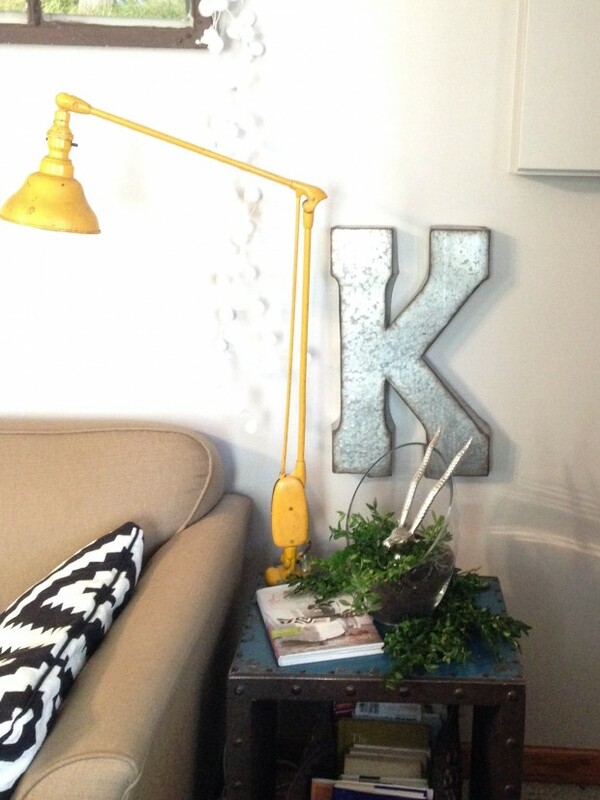 The metal ‘K’ we hung after the decor was done. It rounded out this area perfectly. My friend was on the phone with her husband when she was looking for nails to hang it with. Her husband said ‘I won’t even ask why you want nails.’ The poor husbands around here – I think they groan when they hear my name! Isn’t this space just the best? Looks like it came straight from a magazine or home decor book. 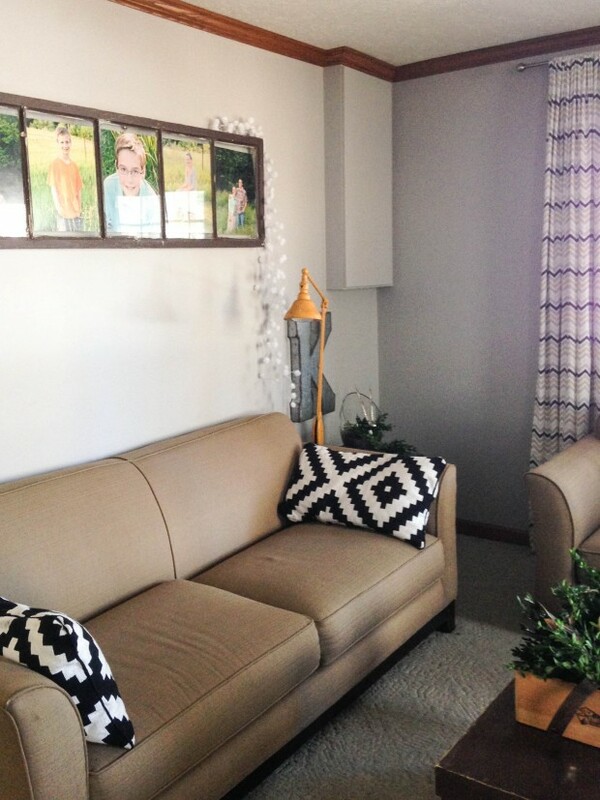 Love the old window used to hold the pics of her kids, the cool pillows, the lamp – it’s just so amazing! Decor filled toolbox on the ‘coffee table’. Top of the bookshelf in the entry. Love that sign – sorry the pics are a bit fuzzy – that’s what I get for forgetting the real camera. 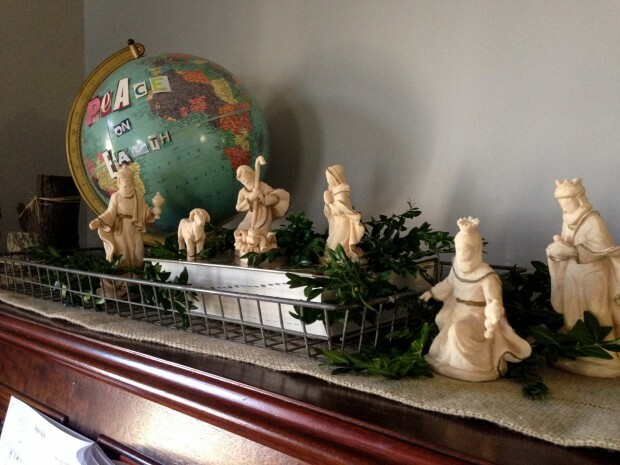 Top of piano. 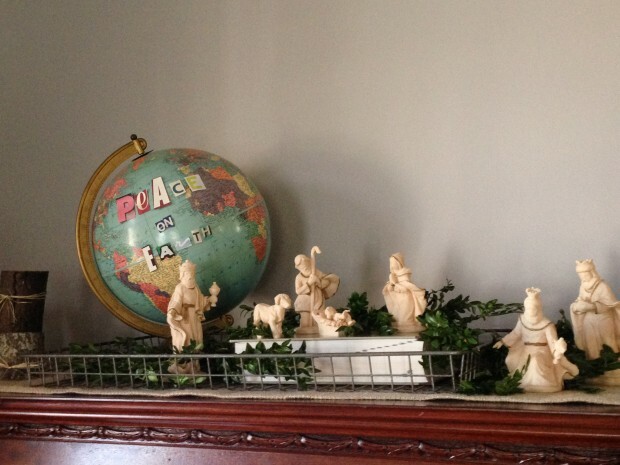 My friend already had the globe detailed and I loved it and knew it had to be used somehow and the nativity was the perfect thing to add to the display. The JOY sign lights up – how cool is that? I think she said she got these letters at Kohls – on sale and with a coupon on top of that – woohoo! 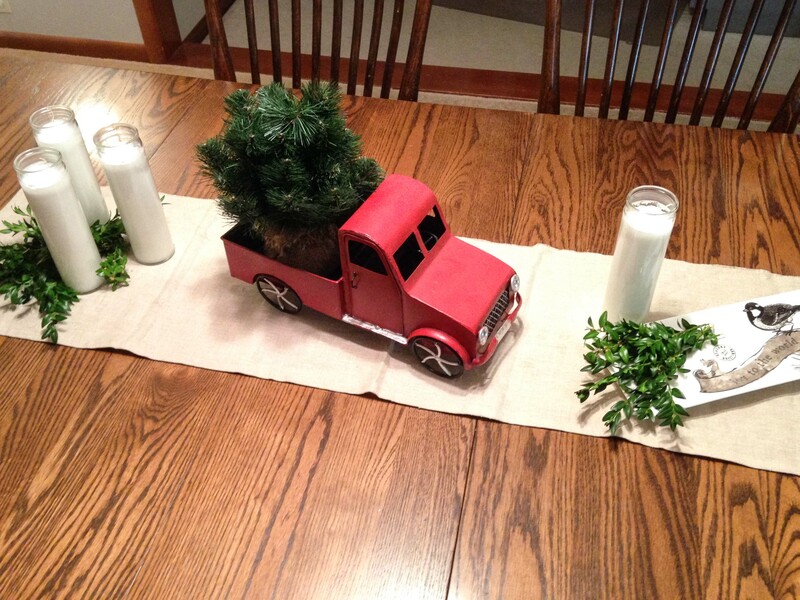 Centerpiece on the dining room table. Love the tree-in-the-back-of-a-truck trend. I hope it hangs around for awhile! 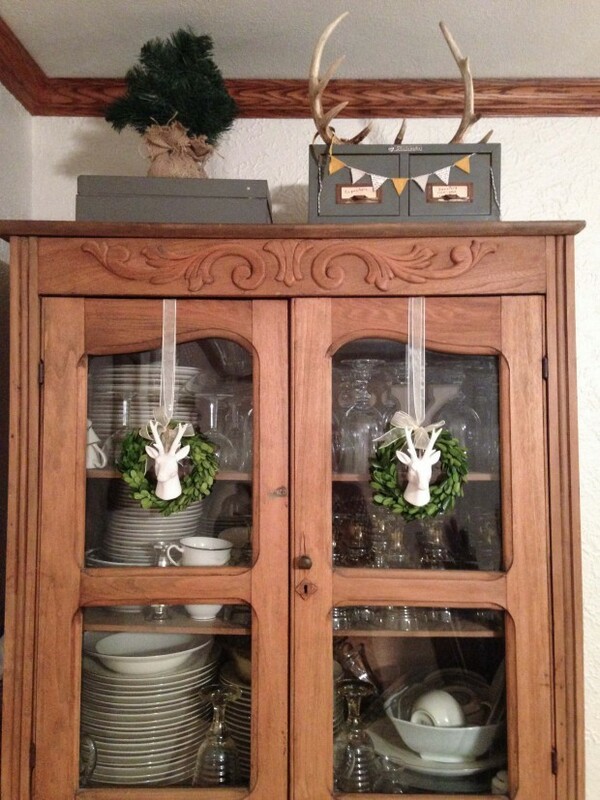 The white deer heads fit perfectly with the preserved boxwood wreaths. Love it when things come together so well. 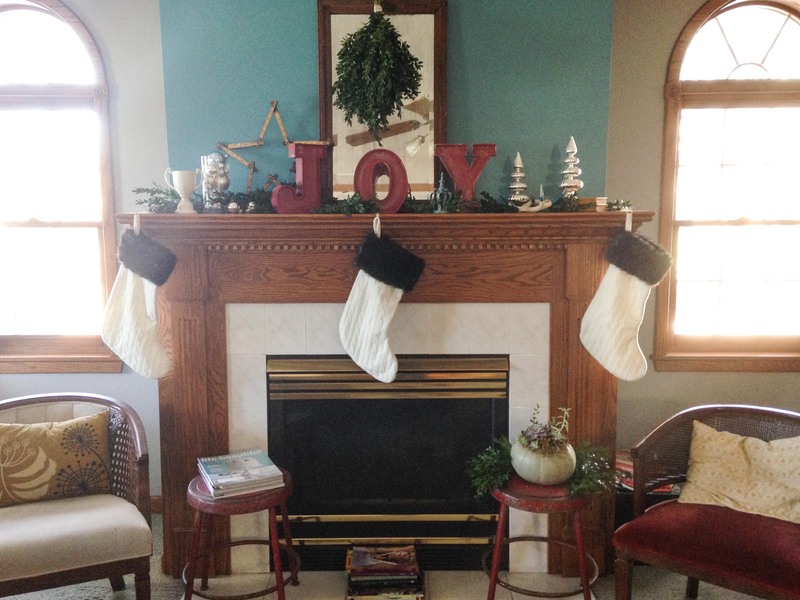 The final addition was the stockings on the mantel. All set for a perfect Christmas. The smiles on her kiddos faces in the pic she put on fb of them with these stuffed full stockings said it was a good Christmas! December has flown. I need to go back and count up how many pillows my 2 assistants and I managed to get made and shipped out before the holidays. And now we are right back at it. I am so blessed and thankful! Glad you are covered up with pillow orders. I can see other people’s homes decorating changes that need to be made but my own, not so much!!! Sometimes it is a lot harder to decide just waht I want in my own home – somehow when you look at it every single day it’s harder to decide what you really really love! You did a great job on your friend’s home, Jill! I think it’s better when someone else can see our rooms with a “fresh eye”. I love all the little pieces and treasures and how you made them come together. 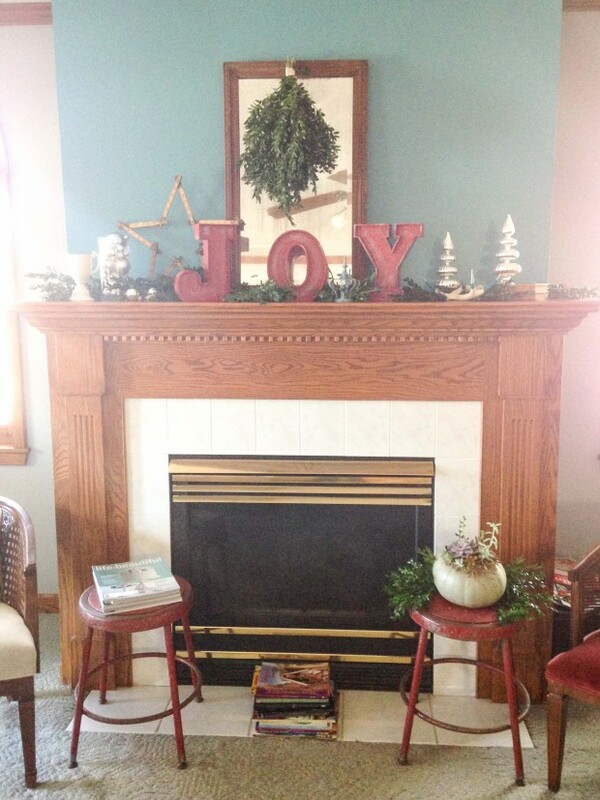 I would covet those red stools, too! Good luck with that ginormous pillow order-good for you!! And Happy New Year to you and your dear family! Thanks Jane! And I’m slaving away on pillows LOL! I have 2 assistants helping me so it’s going well!